Washington—High school students from the District of Columbia and surrounding counties within the National Capital Region (NCR) participated in BDPA's Washington, D.C. Chapter 2009 High School Computer Competition (HSCC) this year with volunteers, local support from area corporations, and use of the D.C. Courts' state-of-the-art training facilities shown below. For the third year in a row, Philadelphia wins NBDPA Chapter of the Year; Southern Minnesota team wins National High School Computer Competition (HSCC). 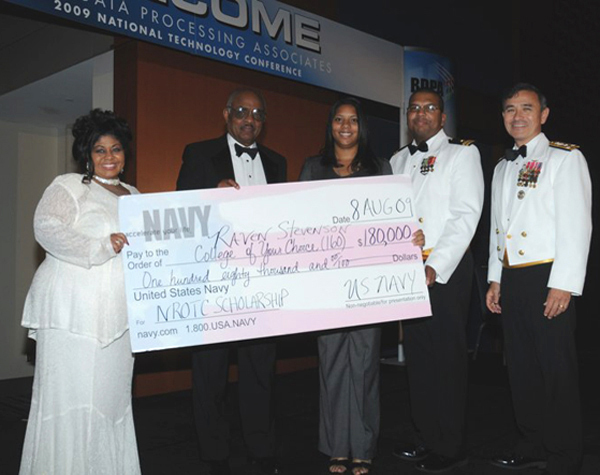 The U.S. Navy is now awarding full scholarships to qualified students nationwide. BDPA student members have until September 23rd, 2009 to submit their names for immediate consideration. Also during the annual awards gala, the Oracle Education Fund donated $50,000 to NBDPA on behalf of the Oracle Corporation. For more information, call NBDPA at 1.800.727.BDPA (2372). Ms. Raven Stevenson (center), a National BDPA HSCC finalist from NBDPA's Greater Columbia, SC Chapter, receives her full Navy scholarship to the school of her choice. Also shown with Ms. Stevenson above (L-R) is Ms. Denise Holland, President NBDPA; the Honorable B. J. Penn, Assistant Secretary of the Navy; Lieutenant Dennis Holmes, US Navy; and Vice Admiral Harry Harris, Jr., US Navy. bdpatoday (BT) reports the following NBDPA awards were announced by NBDPA during this year's 31st Annual National BDPA Technology Conference Awards Gala recently held at the Raleigh Convention Center in Raleigh, North Carolina. Outstanding Chapter President - Monique Berry, The Vanguard Group, Inc. These special pre-application workshops are arranged quarterly by participating BDPA Chapters. 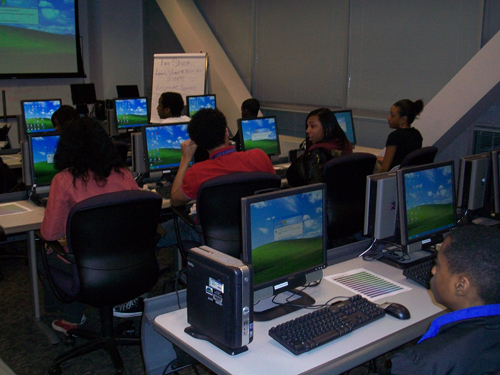 In Washington, the previous semester's APBi included BDPA's High School Computer Competition (HSCC) scholarship information, IT Showcase, federal application requirements, and current regional opportunities in government for qualified students. The next APBi is scheduled for October 8th, 2009 in Washington, D.C. Details and invitations will be provided to student members, faculty, AITP, LISTA, and neighboring BDPA Chapters. Click here to advertise online.